By Romy Ellenbogen, Amy Sherman on Thursday, November 29th, 2018 at 2:40 p.m.
Any Florida motorist stuck in a traffic jam will tell you that Florida has some work to do to ease traffic congestion in a state with a growing population. Ahead of the 2014 election, Gov. 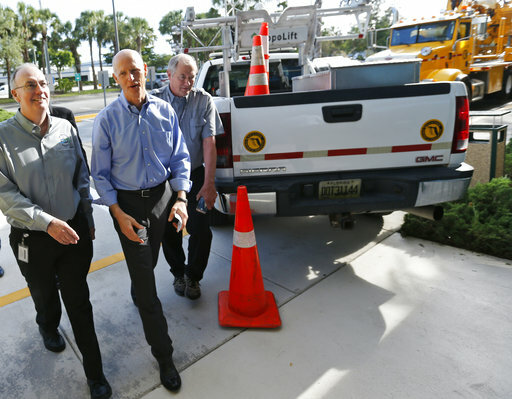 Rick Scott promised to expand and improve Florida's roadways with a $25 billion investment over the course of the next five years. He pledged to add new lanes on major highways, enhance existing roads and make safety improvements. Florida spent about $21 billion in roads between fiscal years 2014-15 and 2017-18. If we add in the projected spending so far in 2018-19, that would bring the total to about $26 billion. The highest amount went to adding road capacity work, followed by resurfacing of existing roads, Department of Transportation spokesman Tom Yu said. Scott's initial promise was to ease congestion. Yu said that despite there being more road traffic in recent years, levels of congestion, as measured by delay times, have decreased. For example, in 2007 the State Highway System logged 305.1 million vehicle miles traveled daily, which went up to 322.1 million in 2016. Still, Yu said in 2007 there were 130,500 hours of delay at peak hours on the highway, but in 2016 the delay was 121,200 hours. One of the projects during Scott's tenure was the addition of the state's first Diverging Diamond Interchange, in which the roads create a diamond-like shape from above. The $75 million project, which began in August 2015 and wrapped in May 2017, works to alleviate traffic that used to back up around the I-75 and University Parkway in Sarasota. The design was given a national award from the American Council of Engineering Companies. "This really was our most congested interchange, so we knew we had to try something different, something that would really change that area in term of how much traffic it gets," Florida Department of Transportation spokesman Zachary Burch said. Along with the interchange, which may be expanded to other areas of Florida, Burch said in his region they have also invested in widening dozens of miles of I-75 to six lanes and have invested $250 million into State Road 82 in Fort Myers. The spending is there. But a report says Florida's highway system still has a long way to go. The Reason Foundation, a free market public policy research nonprofit, publishes an Annual Highway Report that ranks the performance of state highway systems in 11 categories, including spending per mile, pavement conditions, deficient bridges, traffic congestion and fatality rates. The ranking placed Florida in 35th overall and 49th in disbursements per mile, based on 2015 data reported by states to the Federal Highway Administration. That means the data doesn't reflect much of Scott's second term. Baruch Feigenbaum, assistant director of transportation policy at the Reason Foundation and co-author of the report, told PolitiFact that prior to 2000 the state under-invested in its roadways. That means that some of the spending is a catch-up from previous under-investment. Congestion in Florida has decreased slightly, but it's fairly minor, Baruch said. "Reducing congestion in a state as fast growing as Florida is challenging," he said. "What the state is doing in urban areas is adding variably priced toll lanes. Many transportation organizations across the political spectrum including us believe these lanes are the best long-term strategy for increasing mobility." Yu, the FDOT spokesman, pointed to a different analysis by 24/7 Wall St, a financial website, that created an index that included accounting for the share of roads in poor condition and the share of bridges classified as structurally deficient. On those measures, Florida ranked third lowest. This index placed Florida eighth highest on highway spending as a percentage of the total spending, based on 2015 data. Reports that used different methodologies came up with different rankings for Florida's roads. However, Scott's promise was to support the investment of nearly $25 billion in roads. Based on that criteria, we rate this Promise Kept.